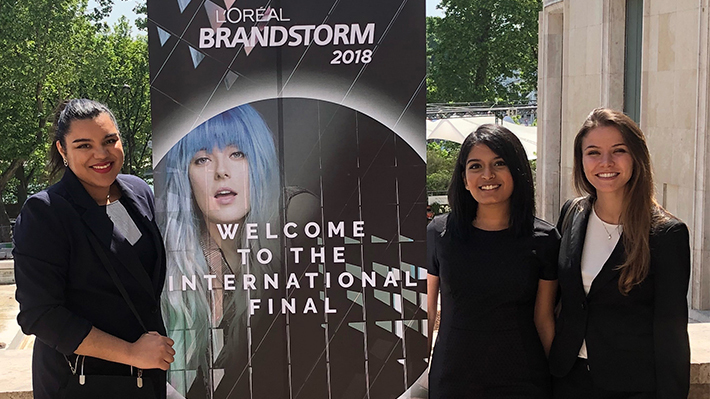 For the second year in a row, the same team of Drexel LeBow undergraduates participated in the L’Oreal Brandstorm Case Competition. This year, though, this team of three young women won first place, beating out teams from Harvard and Berkeley to represent both Drexel University and the United States at the 2018 international finals in Paris. Drexel’s team, dubbed DragonFire, consisted of three LeBow seniors: Amalya Boulajouahel, a business and engineering major with a finance concentration; Bianca Fernandes, a marketing and business analytics major; and Laura Sturzenegger, a marketing, finance and business analytics major. DragonFire’s product idea, titled “Connect,” utilizes technology and big data, with data collection uniting salons, consumers and L’Oreal. Boulajouahel notes that she and her team members all worked at SAP for co-op, and their backgrounds in technology and data analytics were an asset in the competition. After submitting their initial idea, along with a video, in February and being accepted into the competition a few weeks later, the team spent two months honing their product in consultation with a L’Oreal employee. The three students met as members of Alpha Kappa Psi, the co-ed business fraternity. They have been friends since their first year, well before they became team members working on the 2017 L’Oreal competition. “I believe it’s the things we’ve learned as brothers that gave us the confidence and skill to make it to this point in the case competition,” Fernandes says. Stanley Ridgley, associate clinical professor of management, served as team advisor and mentor, working with the students through long evening sessions preparing and honing their five-minute presentation. After five times through the presentation, the Drexel team advanced to the competition’s finals. Along with teams from the University of Michigan, New York University and Penn State University, the team made their presentation received follow-up questioning from David Greenberg, president for L’Oreal’s Professional Products Division in North America, for an hour following the final round before receiving word that they had won. Even with their outstanding performance in New York, the team isn’t resting on their success. Teams competing in New York came from Harvard University, University of California Berkeley, University of Southern California, New York University, North Carolina A&T, University of Michigan, Northwestern University, University of Texas and Penn State University. The team from Penn State joined Drexel into the top two, with both teams representing the United States at the global competition on May 17 in Paris. Boulajouahel and Sturzenegger have both visited France previously; Sturzenegger studied abroad at ESCE Business School in Paris in fall 2015. A co-op at Strawbridge & Clothier led Susan Kelly to a whirlwind career in fashion that included positions at Armani and Paule Ka.